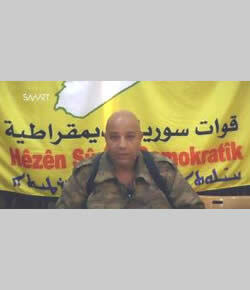 Colonel Talil Slaw, spokesman for the Syrian Democratic Forces (YouTube, November 6, 2015). 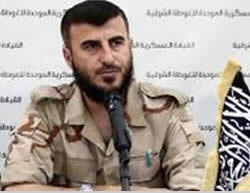 Jaysh al-Islam Commander Zahran Alloush. 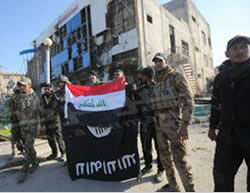 Iraqi soldiers waving the Iraqi flag and holding the ISIS flag upside down, as a symbol of ISIS’s downfall in the city. After around seven days of fighting, the Iraqi Army took over most of the city of Ramadi. 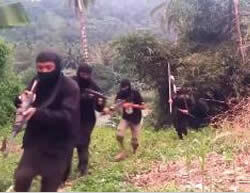 According to reports, most of the ISIS operatives were killed in the fighting and a small number fled the city. Photos shown on Iraqi television on December 28, 2015, show the Iraqi flag flying in the government compound that housed ISIS’s headquarters. According to an Iraqi Army spokesman, although ISIS forces have been defeated, there are still some pockets of resistance in the city (estimated at around 20% to 25% of the area of the city). The Iraqi Prime Minister, who rushed to Ramadi for a “victory visit,” said that by the end of 2016, the removal of ISIS from Iraq would be completed. The US and other Western countries that belong to the coalition congratulated the Iraqi Prime Minister on the achievement. The city of Ramadi is the capital of the Sunni Al-Anbar province (the largest province in Iraq). It was occupied by ISIS on May 15, 2015, in what seems, in retrospect, the pinnacle of ISIS’s territorial achievements. When its liberation by the Iraqi Army and the Sunni tribes that support is completed, it will mark the most significant achievement of the campaign against ISIS. From ISIS’s perspective, the possible loss of Ramadi is the latest in a series of setbacks that it has suffered in Iraq (and in Syria) over the past year (the loss of the cities of Tikrit and Baiji north of Baghdad, and Sinjar, west of Mosul). Although the next strategic target of the Iraqi Army, supported by the coalition, is the city of Mosul, ISIS’s territorial base in Iraq, there is still the need to cleanse Al-Ramadi and its surroundings and the whole Al-Anbar province from the presence of ISIS (which continues even after the conquest of Ramadi). 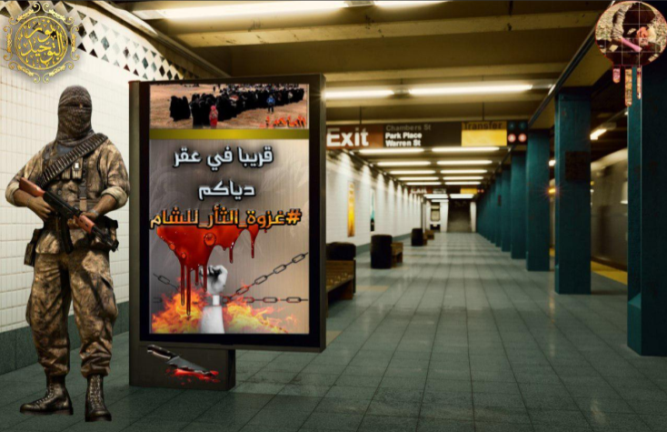 In the ITIC’s assessment, the current “target” is the city of Fallujah, the jihadists’ stronghold in Iraq during the period of the US Army presence, which was cut off from its supply lines and from the core of the area under ISIS’s control after the conquest of Ramadi. This week, however, there have already been reports of clashes in the city and its surroundings, and it has reportedly been surrounded by the Iraqi Army. 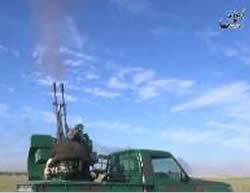 Syria– the airstrikes were concentrated in the areas of Al-Hasakah, Al-Raqqah, Marea (north of Aleppo) and Ain Issa. 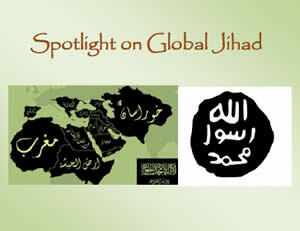 The airstrikes targeted ISIS operatives, buildings, battle positions and vehicles, among other things. Iraq– the airstrikes were concentrated in the areas of Ramadi, Fallujah, Kisik, Mosul, Baiji, Habbaniyah and Sinjar. The airstrikes targeted ISIS operatives, IED manufacturing sites, firing positions, buildings, bunkers, staging zones, headquarters, car bombs, artillery, and checkpoints, among other things. In Iraq, the coalition forces attacked ISIS targets in the city of Ramadi, thereby providing air support to the Iraqi Army forces that took over the city. Steve Warren, spokesman for the international coalition against ISIS, detailed the activities and operations carried out in the city of Ramadi to support the Iraqi Army forces. 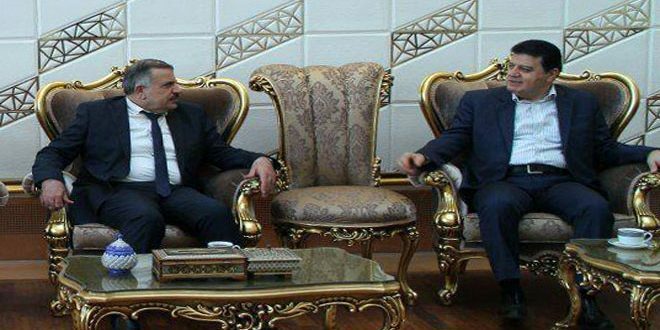 Among other things, he said that the international coalition was working in Syria’s eastern desert and in the mountainous area north of Baiji, in support of the Iraqi security forces (US Department of State website, December 22, 2015). According to a report in the French newspaper Le Parisien, during the past year ISIS lost over 14% of the areas that it had controlled in 2014. According to the report, following the massive attacks, a trend of withdrawal has been identified among ISIS operatives in northern Syria. The report hypothesizes that this may be due to a change in ISIS’s strategy (Le Parisien, December 24, 2015). During 2015, ISIS did indeed lose vast areas that it had controlled, mainly in Iraq but also in Syria. In Iraq, the Iraqi Army and Shiite militias took over the important cities of Tikrit and Baiji, north of Baghdad, and the Kurdish forces (Peshmerga) took over the Sinjar region. In Syria, the Kurdish forces (YPG) managed to take over the cities of Kobani and Tell Abyad and to create territorial contiguity along most of the Syrian-Turkish border. 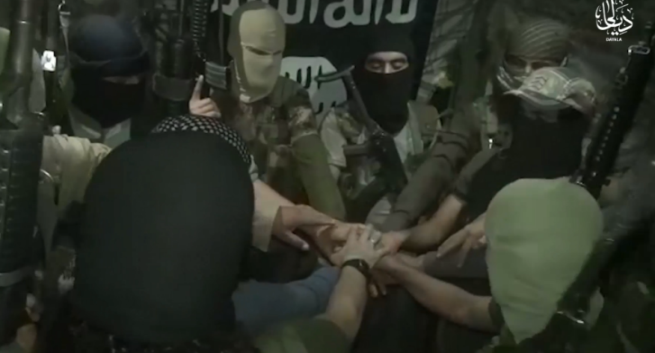 ISIS also suffered blows in the area of the Al-Yarmouk camp south of Damascus (from where it is expected to evacuate its operatives and their families); in the southern Syrian Golan Heights (where the ISIS-affiliated Al-Yarmouk Martyrs Brigade has weakened); and east and south of Aleppo (where the Syrian Army managed to break the siege on the Kuweyres military airbase and establish itself in the rural area south of Aleppo). Russian warplanes continued their attacks in Syria, mainly in the areas of Homs, Idlib, Latakia, Aleppo, Deir al-Zor, and Damascus. According to the Russian Defense Ministry spokesman, during the past week, the Russian Air Force carried out around 300 sorties, during which it carried out more than 1,000 airstrikes in Syrian territory. According to the Russians, the airstrikes hit a training camp in Idlib, where instructors from countries neighboring on Syria were staying, destroyed an Ahrar al-Sham command post in Aleppo, hit trucks in Homs that were carrying weapons to ISIS, and destroyed three oil rigs, two oil tankers and a large number of trucks near Deir al-Zor (TASS News Agency, December 23, 2015). According to the Russian Defense Minister, since commencing its operations, the Russian Air Force has carried out 5,240 sorties, including 145 long-range sorties. The achievements mentioned by the Defense Minister included the liberation of the Kuweyres military airbase in northern Syria and the expansion of the surrounding areas that are controlled by the Syrian Army. He also mentioned an additional achievement, the disruption of ISIS’s oil exports. According to the minister, more than 2,000 oil tankers have been destroyed and many infrastructure sites have been damaged. However, he believes that despite the airstrikes, oil smuggling by ISIS has not stopped and is now being carried out in small convoys at night, mainly near the Iraqi border (Reuters, December 25, 2015). 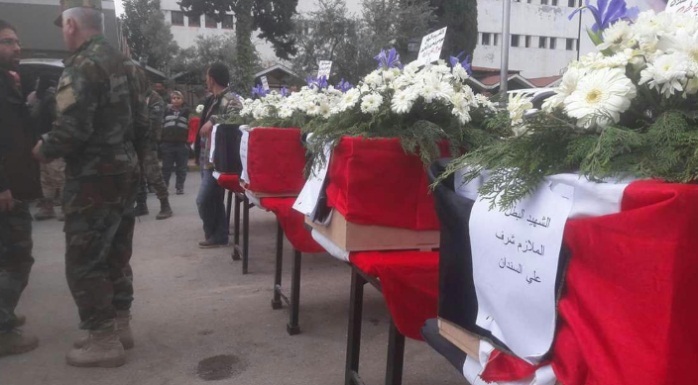 Amnesty International has published a report on the airstrikes carried out by the Russians in the areas of Homs, Idlib and Aleppo between September and November 2015. The report focuses on six incidents in which it claims that at least 200 civilians were killed and thousands more civilians were injured. The report includes evidence allegedly proving that the Russian authorities were trying to conceal incidents in which they hit civilians, in a mosque and in a field hospital, and fired indiscriminately at populated areas. According to the report, the Russian airstrikes in Syria are liable to be regarded as war crimes. The report also notes that there is proof that Russia used unguided cluster bombs attacks in civilian areas (Amnesty International website, December 23, 2015). According to Russian Presidential Spokesman Dmitry Peskov, the Russians have no information about the incidents mentioned in the report and therefore, they do not know whether the allegations are credible (TASS News Agency, December 23, 2015). Russian Ministry of Defense Spokesman Igor Konashenkovdismissed Amnesty International’s allegations, saying that the organization’s accusations are false. According to him, the report does not provide evidence to support them (TASS News Agency, December 23, 2015). According to Viktor Bondarev, commander of the Russian Air and Space Forces, there were no cases in which Russian pilots hit civilian targets such as hospitals, mosques or schools. He claims that these accusations are groundless, indicate a lack of credibility of the report and stem from a lack of evidence in the hands of its authors (TASS News Agency, December 27, 2015). According to the Russian Chief of Operations, Russia is prepared to share with its partners, including the US, any information that could help in the war against ISIS. According to him, Russia expects reciprocity in this regard by the US and the other coalition countries. In response, the US Department of Defense spokesman said that the United States does not intend to cooperate with Russia regarding Syria as long as Russia supports the Assad administration (Sputnik, December 25, 2015; RT, December 27, 2015).